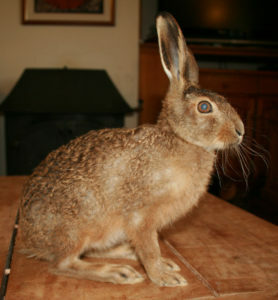 I can’t believe it’s been six years since I hand reared this beautiful hare. I hope it’s him I see on the farm occasionally because we reared him and released him back into the wild once he was acclimatised to feeding himself. 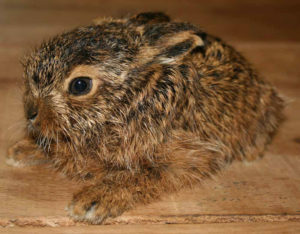 He was found, as a leveret, under some branches Antony was about burn. 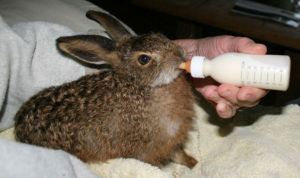 Having researched how to rear a hare on the internet I read that they can be fed ewes milk. Our ewes were lambing at the time so an extra bit of ewes milk was warmed up when feeding the orphan tame lambs, he took to the bottle well! Known as the fastest mammal in the UK, the Brown Hare is capable of reaching speeds up to 45mph (72kph), making them able to outrun a predator. A hare can be distinguished from their close relative the rabbit, by their distinctive long ears with black tips, powerful long hind legs and orange iris in contrast to rabbits eyes which are almost black. The boxing behaviour that can be seen during March is usually female hares fending off amorous males. 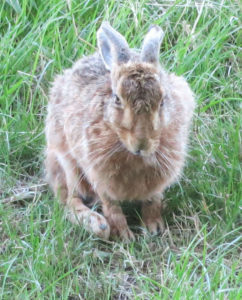 The brown hare used to be a common sight in the British countryside but the population has declined since 1960 , due sadly to various reason such as changes in agricultural practices & traffic deaths.